Support for free markets is increasing across Latin America, including in some countries such as Venezuela and Brazil that are governed by left-leaning presidents. Clear majorities in five of the seven Latin American countries surveyed say that “most people are better off in a free market economy, even though some people are rich and some are poor,” and views are mixed in the other two. At the same time, overwhelming majorities in all seven nations agree that the government has a responsibility to take care of very poor people who cannot take care of themselves. The poll also finds little support for two of the region’s prominent left-leaning leaders – Venezuela’s Hugo Chavez and Chile’s Michelle Bachelet – while Brazil’s Luiz Inacio Lula da Silva receives more positive ratings. Majorities in both Venezuela and Chile say they have confidence in their own leaders to do the right thing regarding world affairs, but majorities or pluralities elsewhere in the region say they have little or no confidence in the Venezuelan and Chilean presidents. With the exception of Mexico, large proportions in the Latin American countries surveyed say they trust Brazil’s Lula. Opinions about Fidel Castro’s impact on Cuba are mixed. Pluralities in Bolivia, Brazil, Argentina, and Peru think Castro has been good for his country, while a majority of Venezuelans and Mexicans and a plurality of Chileans disagree. 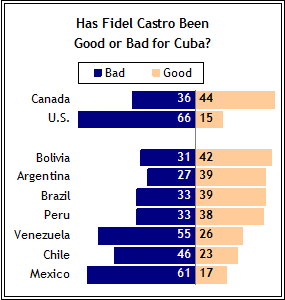 In Canada, more see Castro’s impact as positive than negative, while an overwhelming majority in the United States say the Cuban leader has been bad for his country. Publics in Latin America and North America also express mixed views about Cuba’s future. In general, Latin American publics rate Brazil and Venezuela more favorably than they rate the leaders of those countries. Brazil is somewhat less popular in Mexico and Bolivia than it was five years ago, but the regional power is still rated favorably by majorities or pluralities in the seven Latin American countries surveyed. Similarly, large proportions across the region also express favorable opinions of Mexico, another Latin American economic and political power. The balance of opinion toward Mexico is also positive in both Canada and the United States. The impression that free market economies work well is more widespread today than it was five years ago in five of the six Latin American countries where trends are available. The shift in opinion has been most dramatic in Argentina, where the percentage agreeing that people are better off in a free market economy is up 17 points, from 26% in 2002 to 43% in this year’s poll. Mexicans, Brazilians, Venezuelans and Peruvians, too, are more likely to say people are better off in a free market today than they were five years ago. 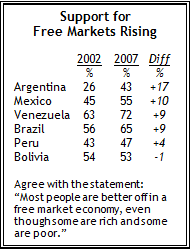 Bolivia is the only country in which views of free markets have not changed since 2002. 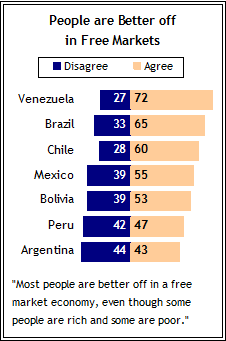 Venezuelans are more likely than other Latin Americans to agree that most people are better off in a free market economy. Support for free markets is even strong among Venezuelans who express positive views about Chavez, a vocal critic of free market systems. Fully 68% of those who say Chavez is having a good influence on their country also say they favor a free market economy. Views of free markets are more mixed in Bolivia, where President Evo Morales, a close ally of Chavez, has nationalized the country’s oil and gas industries. Still, the balance of opinion is in favor of free markets – 53% of Bolivians agree and 39% disagree that most people are better off in a free market economy. Among Morales supporters, half express support for free markets systems. Even though support for a free market economy has grown, publics in the seven Latin American countries polled are nearly unanimous in saying that the government has a responsibility to care for very poor people who cannot take care of themselves. Nine-in-ten in Brazil and Chile share that view, as do similar proportions in Argentina (89%), Peru (86%), and Venezuela (86%). More than eight-in-ten in Mexico (81%) and slightly fewer in Bolivia (78%) also agree that the government has a responsibility to care for the poor. Venezuelan President Hugo Chavez inspires little confidence among publics in the region. Solid majorities in Chile (75%), Brazil (74%), Peru (70%), Mexico (66%), and Bolivia (59%) express little or no faith in Chavez’s decision making. In fact, majorities in Brazil (56%) and Peru (53%) say they have “no confidence at all” in the Venezuelan leader. Opinions about Chavez are more mixed in Argentina, where four-in-ten have a lot or some confidence in Venezuela’s president when it comes to international affairs and 43% say they have little or no confidence in him. (For a more detailed analysis of opinions about Chavez, see Global Unease with Major World Powers , released June 27). Opinions about Chilean President Michelle Bachelet are only slightly less negative than opinions about Chavez. With the exception of Chile, majorities or pluralities across the region express little or no confidence in Bachelet to do the right thing regarding world affairs. The Chilean leader is rated most negatively in Bolivia, which has not had full diplomatic ties with Chile since the late-1970s. Nearly two-thirds (66%) of Bolivians have little or no confidence in Bachelet while slightly less than a quarter (23%) say they trust her. Majorities in Peru (58%) and Brazil (53%) and half in Venezuela (50%) also say they have little or no confidence in Bachelet. Bachelet, Chile’s first female president, receives comparable confidence ratings from both men and women. In fact, the main difference is that women in many parts of the region are less likely to offer an opinion about Chile’s leader. For example, nearly four-in-ten Mexican women (39%) are not familiar enough with Bachelet to rate her, compared with just over a quarter of men in that country (26%). In Brazil, more women than men also decline to offer an opinion on Bachelet (26% of women vs. 15% of men). Compared with the broad skepticism about Chavez and Bachelet, Brazilian President Luiz Inacio Lula da Silva receives substantially more positive ratings from his neighbors. Half or more in Venezuela (55%), Peru (53%) and Chile (50%), and pluralities in Bolivia (47%) and Argentina (43%), express a lot or some confidence in Lula. Lula also is popular in his own country: about six-in-ten Brazilians (61%) trust him to do what is right regarding world affairs. The Brazilian president receives his lowest ratings in Mexico, where 42% express little or no confidence and only about three-in-ten (28%) say they have confidence in him. While Venezuelan President Hugo Chavez and Chilean President Michelle Bachelet are unpopular among publics in neighboring countries, both receive positive ratings by majorities in their own countries. Fully two-thirds (67%) of Chileans have confidence in Bachelet to do what is right regarding world affairs. Chile’s president is equally popular among men (68%) and women (66%). Confidence in Chavez’s leadership is tightly linked to views of the United States and George W. Bush. Fully three-quarters of Venezuelans express little or no confidence in George W. Bush, and Chavez, an outspoken critic of Bush, inspires confidence in nearly two-thirds (65%) of Venezuelans who hold negative views of the U.S. president. Among the 23% of Venezuelans who do trust Bush, fewer than one-in-five (19%) also have positive views of Chavez. Venezuelan public opinion about the United States more broadly is far more positive. Fully 56% give a favorable rating of the United States, while 40% express an unfavorable opinion. Among Venezuelans who view the United States unfavorably, more than eight-in-ten (81%) say they have confidence in Chavez. But among the majority who feel positively toward the United States, only about a third (34%) say they have confidence in Chavez. Publics across Latin America generally rate Brazil and Venezuela more favorably than they rate the leaders of those countries. While Hugo Chavez is widely distrusted in neighboring countries, pluralities in Chile (49%), Bolivia (48%), Argentina (44%), and Peru (42%) hold a favorable opinion of Venezuela more broadly. Venezuelans themselves are also more positive about their country than their leader – while slightly more than half (54%) have confidence in Chavez to do the right thing regarding world affairs, fully 83% have a favorable view of Venezuela. Only in Mexico and Brazil do unfavorable views of Venezuela outnumber favorable ratings, and only by a slim margin. Majorities or pluralities in all seven Latin American countries surveyed say they have a favorable view of Brazil. Along with 82% of Brazilians themselves, solid majorities in Venezuela (81%), Chile (76%), Peru (73%) and Bolivia (64%) hold a favorable opinion of Brazil. In Mexico, where just 28% trust Brazilian president Luiz Inacio Lula da Silva, just under half (48%) have a favorable view of Brazil, though even fewer (28%) feel unfavorably. Opinions about Brazil have dropped significantly since 2002 in two of the five countries where trends are available. In Mexico, favorable opinions of Latin America’s most populous country have fallen 10 points from 58% five years ago, and favorability toward Brazil is down nine points in Bolivia. Views of Brazil have not changed substantially since 2002 in Argentina, Peru or Venezuela. Majorities or pluralities in all seven Latin American countries surveyed also express a favorable opinion of Mexico. Nearly three-quarters of Mexicans and Chileans see the country positively (74% in each country), as do 64% in Venezuela, 59% in Peru, nearly half in Bolivia (49%) and Brazil (48%), and 43% in Argentina. Fewer than half of Argentines give favorable ratings to any of the three nations tested (Brazil 47%, Venezuela 44%), but in all three cases, an even smaller number express unfavorable views. Among its NAFTA partners, Mexico receives more favorable ratings in Canada than in the United States. By two-to-one (58% to 29%) more Canadians have a positive opinion of Mexico (58%) than a negative one (29%). But favorable opinions of Mexico have slipped considerably from five years ago, when nearly three-quarters (74%) of Canadians offered a favorable opinion of Mexico. Opinion is more divided in the United States, though favorable ratings still outnumber unfavorable views by a 47% to 37% margin. American attitudes toward Mexico are closely linked to opinions about immigration. Of those who see immigration as a very big problem in the United States, only 35% have a favorable view of Mexico. By contrast, 55% of those who see immigration as a moderately big problem and 64% of those who think it is a small problem or not a problem at all have a positive opinion of their neighbor to the south. Opinions are mixed about whether ailing Cuban President Fidel Castro has been good or bad for his country and about what a post-Castro Cuba will look like. The American public is the most critical of Castro’s regime – two-thirds (66%) say he has been bad for Cuba, while just 15% say he has been good. In Canada, which has enjoyed good relations with Cuba since Castro took power nearly fifty years ago, opinion is more divided – 44% say that Castro’s leadership has been good for Cuba while 36% say he has been bad for his country. In Latin America, criticism of Castro is the most widespread in Mexico and Venezuela, where clear majorities see his leadership as harmful to his country. While Venezuelan president Hugo Chavez is a close ally of the Cuban leader and is popular among his own people, even the Venezuelans who trust Chavez have, at best, mixed views of Castro. Just 43% of Venezuelans who trust Chavez express positive views of Castro, while 30% say Castro has harmed Cuba. In Mexico, criticism of Castro is nearly as widespread as it is in the United States – fully 61% say Castro’s regime has been bad for Cuba, while just 17% believe it has been good. In Chile, too, the balance of opinion is more negative (46%) than positive (23%). In no Latin American public surveyed does a majority express support for Castro, but judgments of Castro’s impact are more mixed, and even somewhat favorable, in many places. In Bolivia and Argentina, the number saying Castro has been good for Cuba is clearly greater than the number saying he has been bad, and slimmer pluralities in Brazil and Peru say the same. Regarding Cuba’s future, publics in both North America and Latin America tend to agree that conditions in Cuba will not deteriorate when Fidel Castro dies, but nowhere is there a consensus that things will get better, either. In the United States, Mexico and Chile – where the general impression is that Castro has been bad for Cuba – four-in-ten (40%) say things will get better there once Castro passes away. But nearly as many (34% in the U.S. and Chile, 28% in Mexico) believe Castro’s death will not change anything, and some others (9% in the U.S., 11% in Chile and 19% in Mexico) think things will get worse. Publics in Venezuela and Peru also are divided. In Venezuela, 37% think conditions will improve while 36% say they will stay the same after Castro dies; in Peru, 32% say things will get better and 31% say they will not change.